The original Samsung Galaxy S II was launched in 2011, and since then it has been replaced by the Samsung Galaxy S III which has gone on to great success. 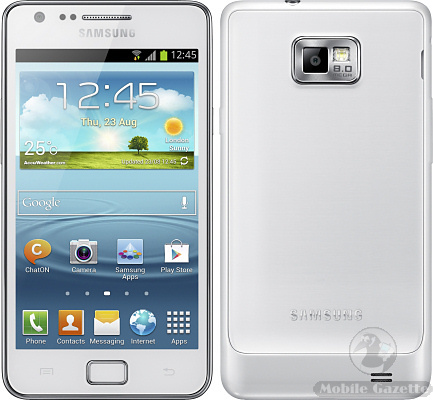 But despite the appearance of the Galaxy S III, the Galaxy S II is still selling strongly - at the time of writing it is the number 9 best-seller in SIM-free phones at Amazon UK. So why is this handset (announced nearly two years ago) still popular? Well, it fills a gap in the range for a relatively powerful phone with a 4.3" display that isn't really matched by anything newer.. and Samsung have made sure that the S II has had software updates, with an upgrade to Android 4.1 promised. So, the Samsung Galaxy S II Plus doesn't really mess around with the formula much. The two main changes are that the S II Plus runs Android 4.1 out of the box instead of version 2.3 (with a load of Samsung's own enhancements on top), and the case is cosmetically slightly different. GLONASS support seems to be new too, but it might be that the hardware was always present in the S II, just not used. One key downgrade is the internal flash memory, which is now 8GB, down from 16GB or 32GB - a move which will presumably make the phone cheaper. In case you are not familiar with the S II, the specification list for the Galaxy S II Plus includes a 1.2GHz dual-core CPU with 1GB of RAM, an 8 megapixel primary camera plus a 2 megapixel secondary one, a 4.3" 480 x 800 pixel display, an FM radio plus all the usual stuff you would expected from a 2011-era Android smartphone. There's an NFC version available too, which is fractionally larger than the standard model. We don't know when the Galaxy S II Plus will hit the market, but it isn't going to be a big stretch for Samsung to build it, so we expect it will hit the market very soon. As for pricing, the Galaxy S II currently retails for about €340 SIM-free, and we would expect to see the S II Plus coming in at the same sort of price.